The Games Institute (GI) conducts research into the past, present, and future of games. Based at the University of Waterloo, the researchers span the breadth of academic disciplines from the humanities and social sciences, through engineering and computer science. With the goal of understanding the compelling user engagement that games deliver in fields ranging from entertainment, education, health, and business, the GI is proud to host students of the SWaGUR program. 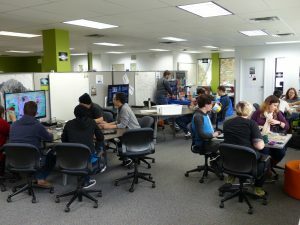 The Games Institute offers a unique interdisciplinary environment for graduate students to conduct collaborative research and be part of the part of the SWaGUR training experience program. Hosting many cutting-edge technologies and providing a comfortable space for generating ideas and running experimental studies, there are many benefits of coming to graduate school here. Both the current Associate Director (Dr. Mark Hancock) and Director of the GI (Dr. Neil Randall) are faculty supervisors for the SwaGUR program for University of Waterloo students. 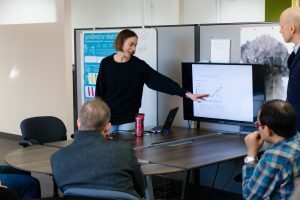 Along with their expertise, participants in this program may reap the benefits that The Games Institute has to offer in the growing field of games and user experience research. One such benefit is access to the Waterloo Game Analysis & Monitoring Environment (or, WatGAME for short). WatGAME is a configurable monitoring and testing games-immersion facility at the GI. 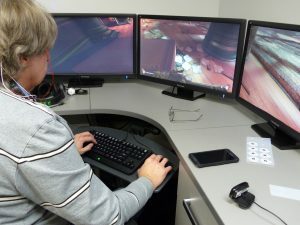 The labs enable the observation of player immersion into the narrative in games, the investigation of existing collaborative gaming contexts, as well as the design and evaluation of next-generation game concepts. Dr. Lennart Nacke of the SWaGUR program is also an active member at The Games Institute. His HCI Games Group brings students from different disciplines together to analyze user interaction in entertainment systems. Dr. Edith Law is an affiliated faculty member of the GI, taking part in exciting research through the Human-Computer Interaction lab at the University of Waterloo. Students from all faculties at the university enjoy the collaborative nature of The Games Institute. With the option of individual cubicles as well as larger spaces for group research, it is truly a unique environment. Weekly socials, campus wide events, cross-institution conferences, as well as research studies conducted at the GI are helping to make this space the central hub for games-related research in Canada. Questions about the SWaGUR program at the Games Institute? Contact the Operations Coordinator, Emily West (elwest@uwaterloo.ca).